I went out to the Town of Mount Royal this morning and came back with a massive load. I left around 730 and got back totally exhausted by noon, breaking only to drop off some of my haul at my friends’ house. My first finds came from this garbage can. 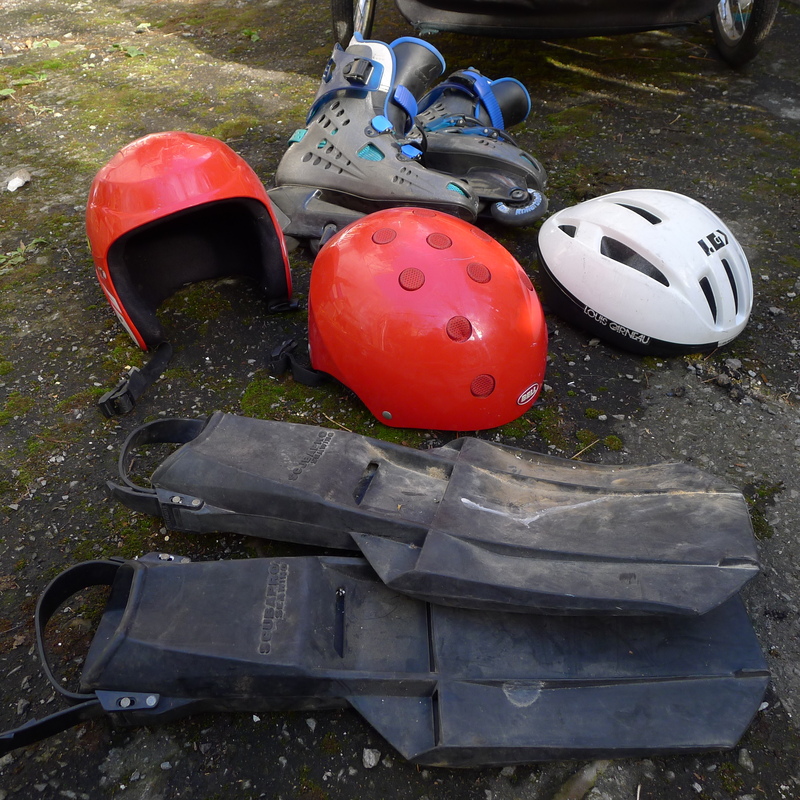 Here we have a few helmets, a pair of diving flippers, and a pair of rollerblades. I’m most happy about the “Bell” brand red bike helmet in the middle. My bike helmet disappeared a while back, this one fits me great and looks mostly unused. Later on I came across this familiar pile in front of a recently sold house. It’s the same place where I found the tourist-y slides and medicine pot last week. 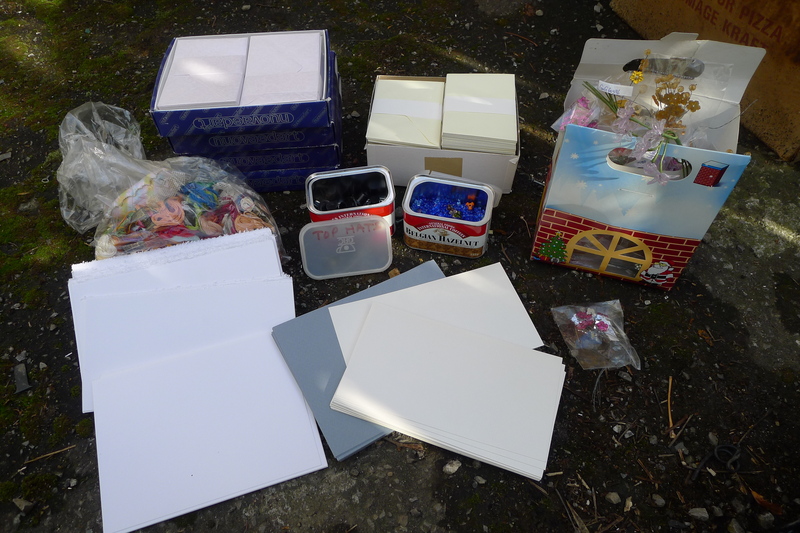 One of the bags contained a collection of fancy little envelopes and papers along with some crafting supplies. The gift bag on the right holds a bunch of little plastic flowers attached to metal wires. One of the tins holds a number of miniature plastic top hats, for what reason god only knows. I’d guess most of this stuff would have been used for invitations of some sort. I threw the whole bag in my trailer. 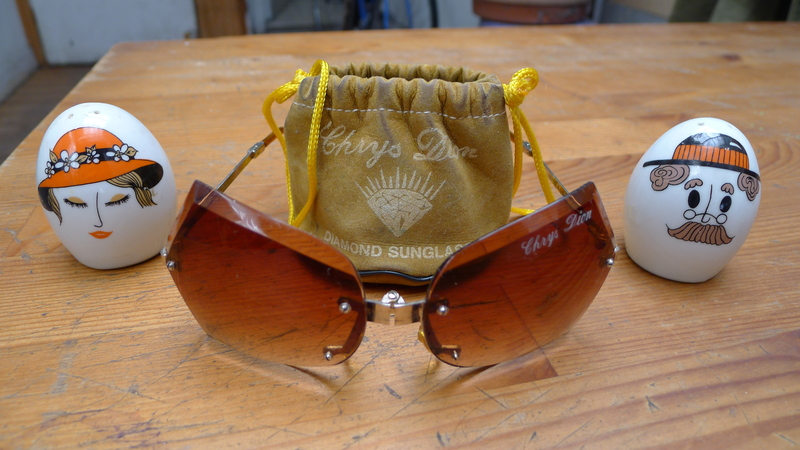 Inside another bag were these cute salt and peppers shakers (made in Japan) and a pair of Chrys Dion “Diamond” Sunglasses. They fold up and go into that little pouch in the background. They’re pretty unique and are generally pretty fabulous. I looked them up online and saw people trying to the same pair for 45 and 52 dollars. I also saved this Japanese wall art. The fabric it’s painted on is a bit bent up but I doubt it’d be that hard to straighten it out again. My guess is that someone probably bought this while vacationing in Japan back in the 70s or 80s. Somewhere in the middle I came across these hockey sticks sticking out of a bin. 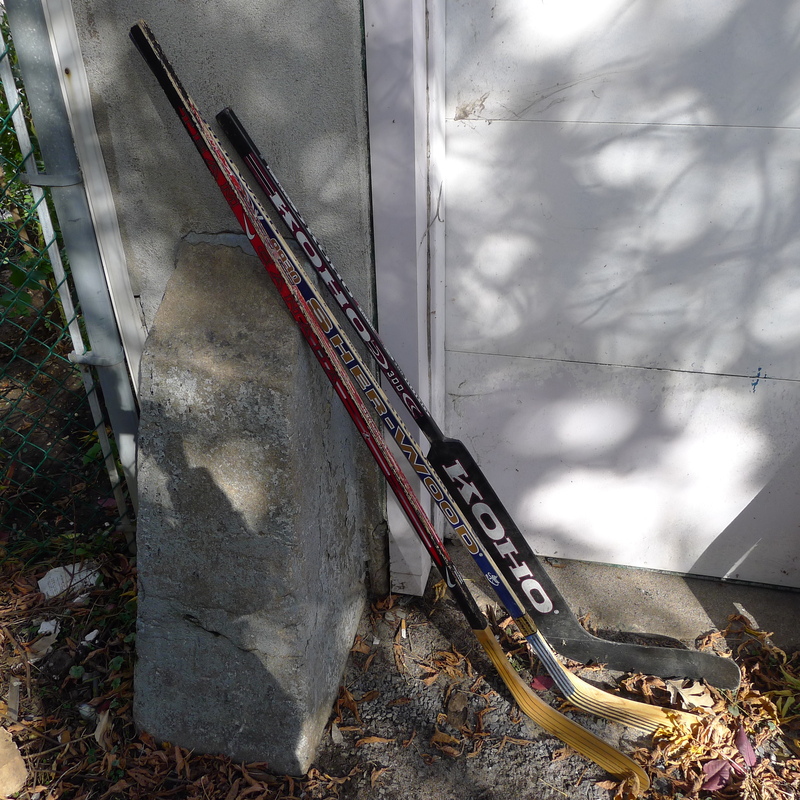 I’m not much of a hockey fan but I still think it’s pretty silly to throw out good hockey sticks. A hockey stick from Canadian Tire generally goes for around 20-30$ with goalie sticks like the one in the back going for a little bit more. That’s not a lot of money in TMR but it’s a fair bit to someone on a fixed budget. I might sell the sticks for a nice discount at a yard sale. I’m thinking about having one more before it gets too cold. I’ve found a lot of stuff recently and it’d be good to clear house a bit. It really depends on the weather, however. I’m not really bothered most days by the waste I come across. I understand that not everyone knows how much things are worth, just how interesting their stuff is, and so on. Today, however, I felt frustration. The hockey sticks were one thing but this pile was another thing altogether. 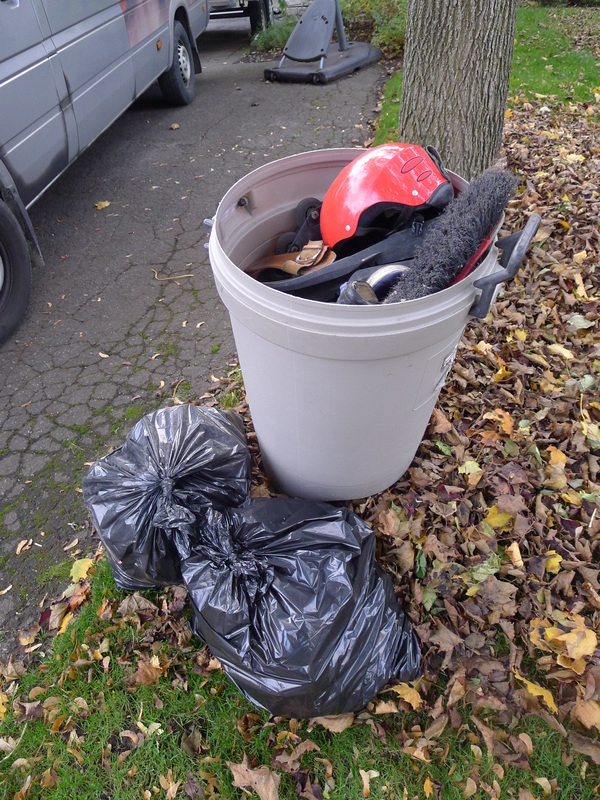 When I arrived there was a moving truck loading up the furniture from the house – whoever left this trash was moving away. The juxtaposition of these manual labourers, who from my experience in the trade were probably recent immigrants coming here for school, with the trash bags containing lots of useful stuff (and some nice sterling silver jewelry to boot) made me fairly annoyed. My fantasy of the owners giving their “trash” directly to the movers as gifts might be a bit unrealistic (especially since there were four workers to divide this stuff between, and they might not even have wanted it anyways) but it’s this kind of thing that makes me think about how much wealth is simply wasted on a day to day basis. 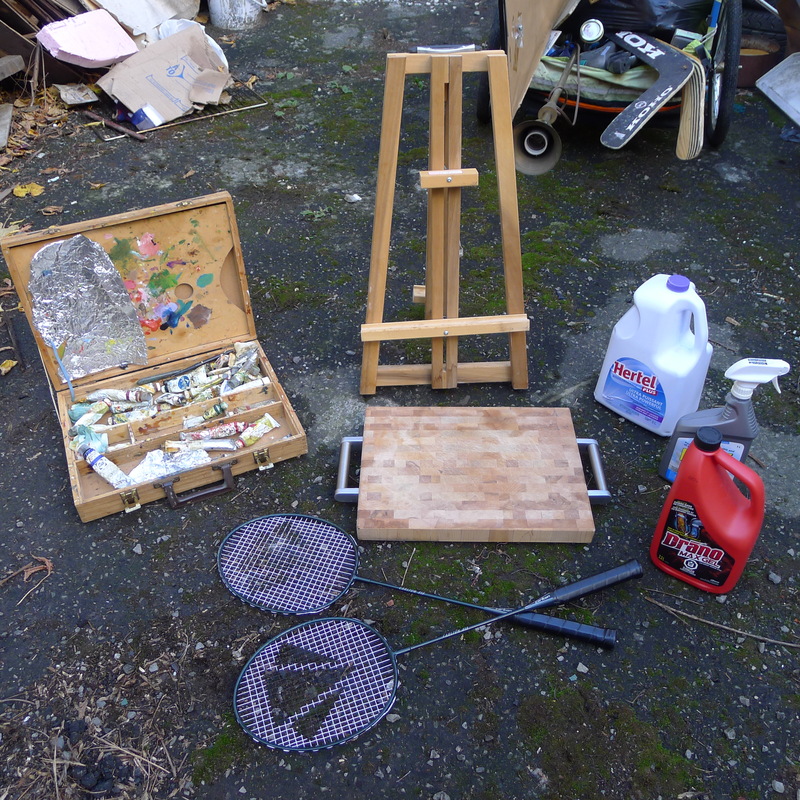 I found a really ballin’ cutting board, a wooden box filled with still-good oil paints, two like-new badminton racquets, some mostly-full cleaners, and what appears to be a mini desktop easel. I took this stuff mostly for my friends, though I might keep the badminton racquets. 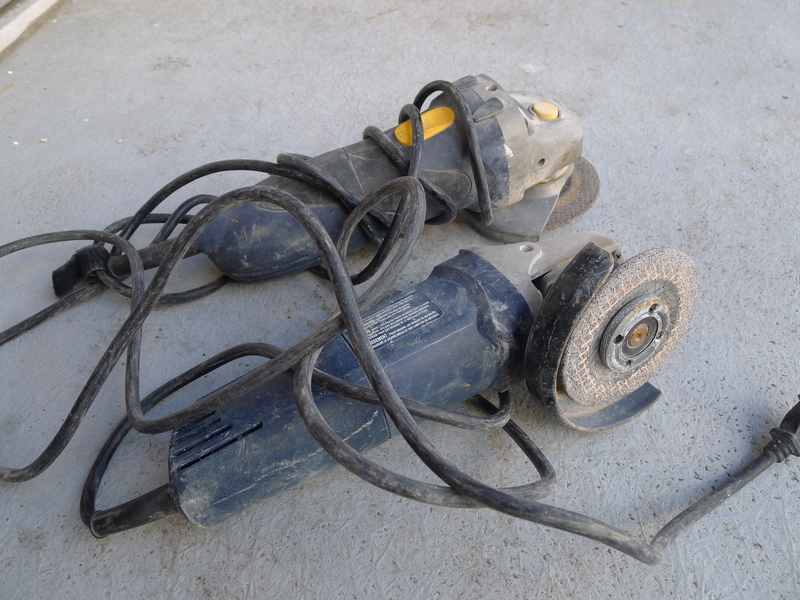 Here’s a couple of edge grinders, both of which work. 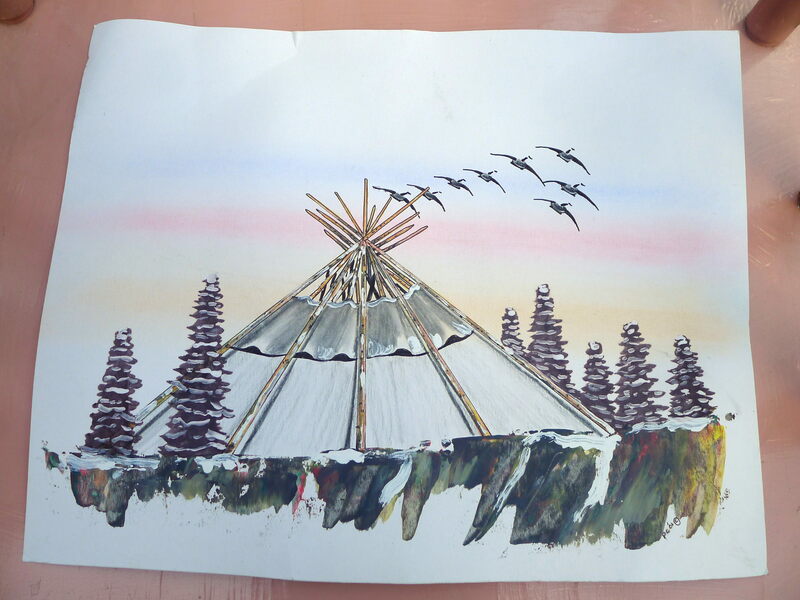 A beautiful original piece of Native American art. The artist’s name is on the back, though I forget what it is at this moment. This is a white wine aroma kit. 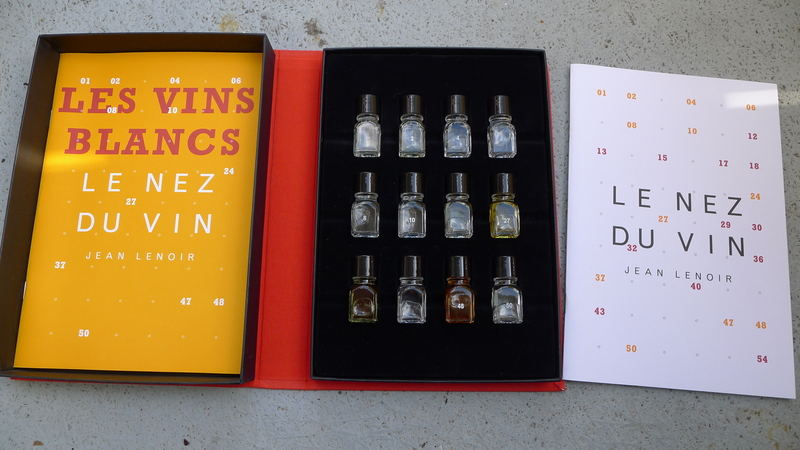 It’s made to train the nose of the aspiring connoisseur to recognize the different scents of wine and comes with a couple of booklets to ease the learning process. Believe it or not these are selling for around 140-150$ new online. I think mine would sell for around 75$ on Ebay, maybe more if I hadn’t of accidentally dropped it, adding a little ding to the front cover. 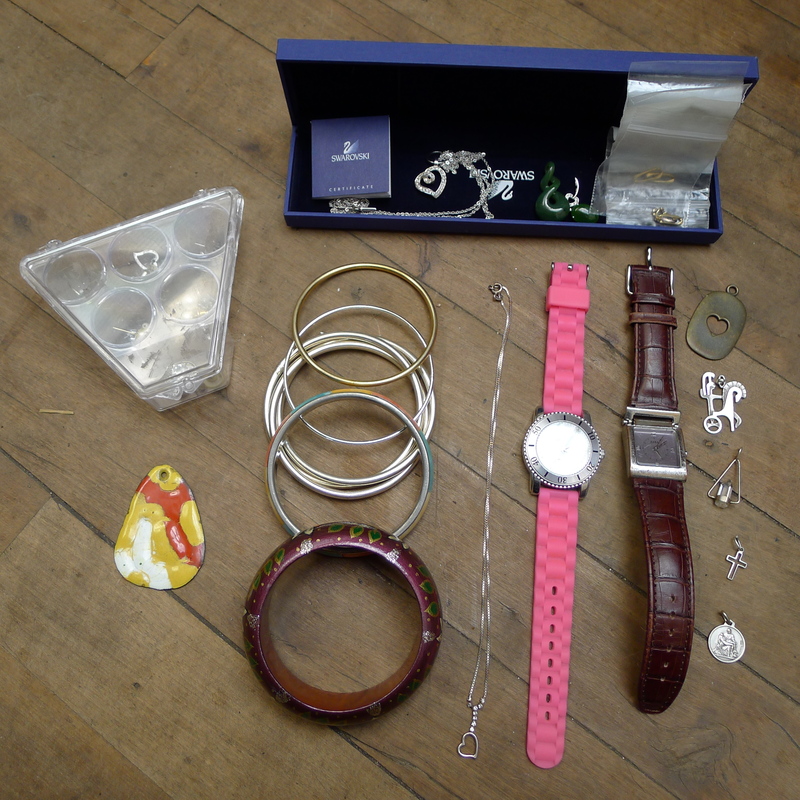 I also found a small cache of jewelry. The pink watch looks completely unused. 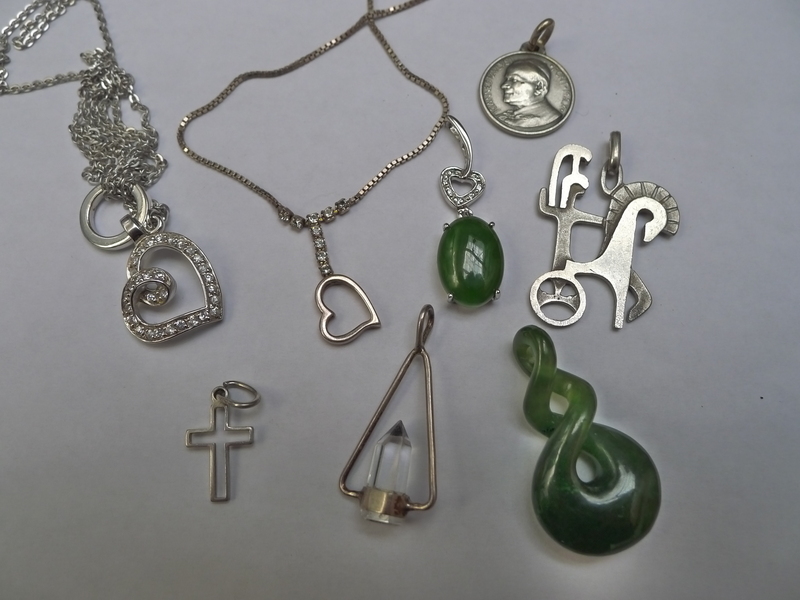 These are probably the nicest pieces, all being made of silver or having a silver base. The necklace on the left was originally in the Swarovski box. It was likely fairly expensive, though you can never sell anything for quite as much as they do in the store. It’s tangled up but should come loose with a bit of work. The green stones look like they could be jade. (Just to clarify, the green stone in the middle is part of a pendant that isn’t attached to the other necklace, though it looks like it in the picture). I like the pendant on the far right that features some sort of mythical charioteer. After that pile I was packing a lot of weight and decided to hit the old dusty trail. 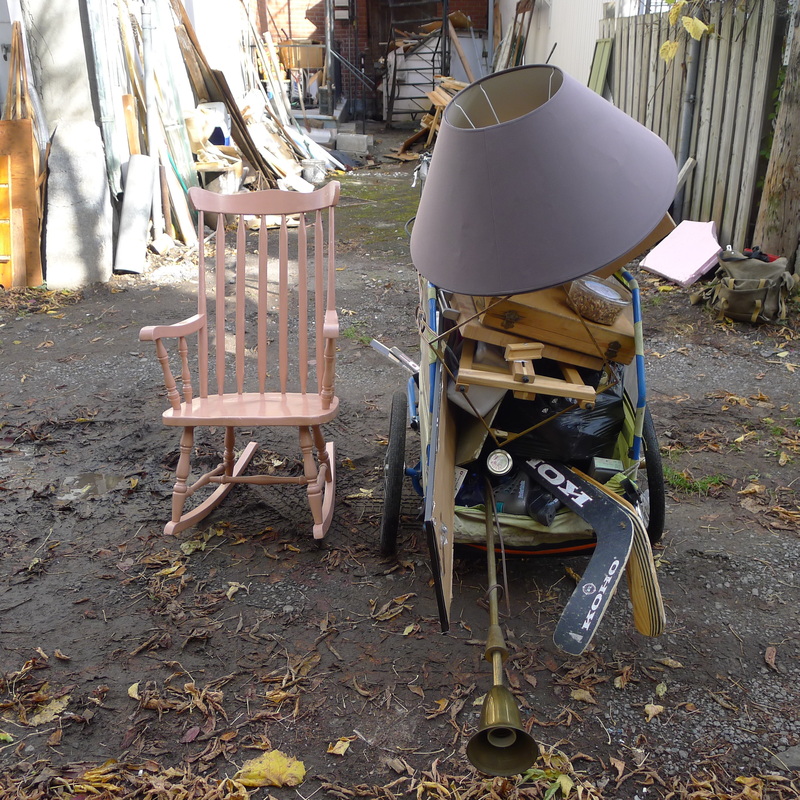 Still, I explored a few new roads on my way home and came across a box full of lampshades and a nice pink rocking chair. I wasn’t far from my friends’ place so I decided to throw the box into my trailer and carry the rocking chair up front. This is by far the most ridiculously full this trailer has ever been. The last couple of kilometres were a real pain as a result. Still, I made it back safe and sound. All in all I’m pretty exhausted. It’s times like this when I remember how much work “the trash hunt” really is, even if it doesn’t feel like it. 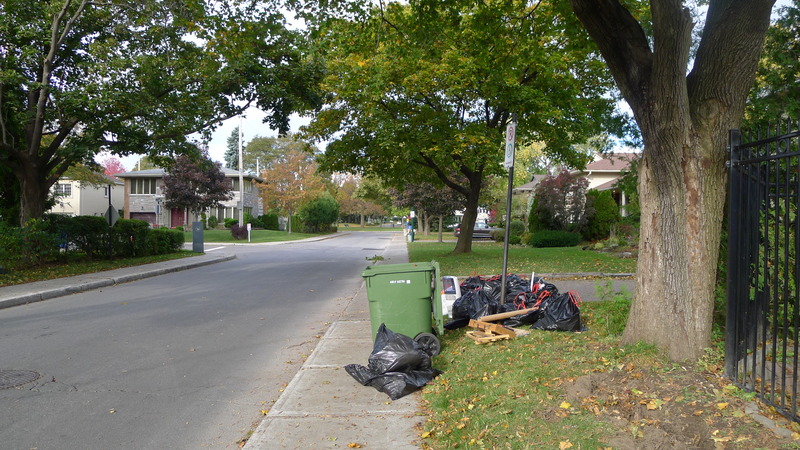 I don’t want to think about moving right now, but tomorrow morning I’ll probably hit the road again and explore the trash days in Outremont or Rosemont. Just making sure you received my congratulations on all your work. 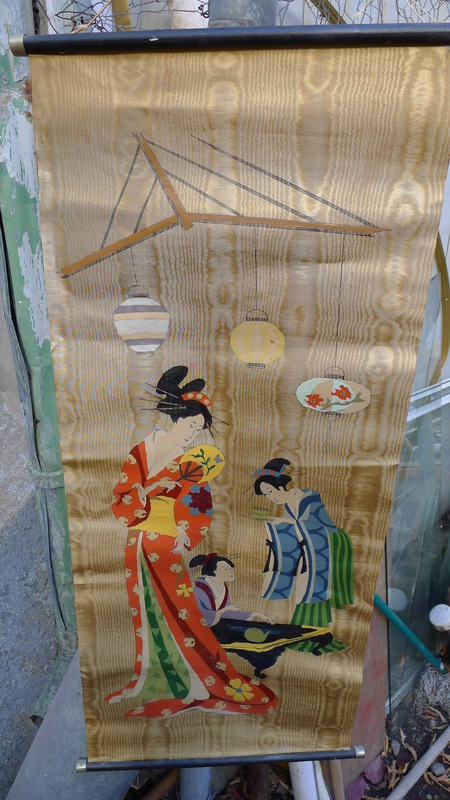 The ladies on the wall hanging are japanese on moiré silk.And those are jade pieces of jewelry. AM STILL ENJOYING THE BLUE LIGHT BULB YOU LET ME HAVE. amazing finds here. good work. very well done. I particularly love those cute salt and pepper shakers made in Japan that you rescued.So cute.Also I was delighted to read yesterday about your trip and discoveries in eastern Ahuntsic.That part of Ahuntsic is so beautiful—it is like a village frozen in time.I live in the Southwest borough but I find parts of Ahuntsic very beautiful.You should go north in Ahuntsic more often.When I walk on Prieur street or Gouin,I always love it. Trees, greenery, parks—Ahuntsic has lots of them. Like you, it astounds and saddens me how much genuinely useful (and often valuable) stuff gets thrown out as trash. Thank you for doing your part! How come more people do not scavenge in TMR despite the wealth there?Do the truck drivers secretly rescue good stuff from the trucks before dumping it in the landfill?The waste is shocking. I’m not sure. I’ve never seen another picker in TMR, not even for cans or scrap metal. There are security patrols, maybe they have pushed people out before (as they tried with me last week). I think garbage truck workers might save things when they are obvious and out in the open. They will not open bags, they just don’t have the time. I’d say that everything I saved other than maybe the hockey sticks would have been junked had I not been there. Great day! Nice treasures, with clearly some money to be made to keep food on the table and your internet and smartphone bills paid … so you can continue on in your great work. 🙂 That Roman on a chariot pendant is sweet! I’m not sure. It’s in the part of Park Ex that is mostly single family homes so it’s less picked through. There was also no furniture, everything was in bags. It seems like not many people go through bags, people are often surprised when I tell them most of my best finds are from bags. I expect in this case that someone passed away a while ago and they are clearing out the house in preparation for a sale. Much of the stuff is quite old. 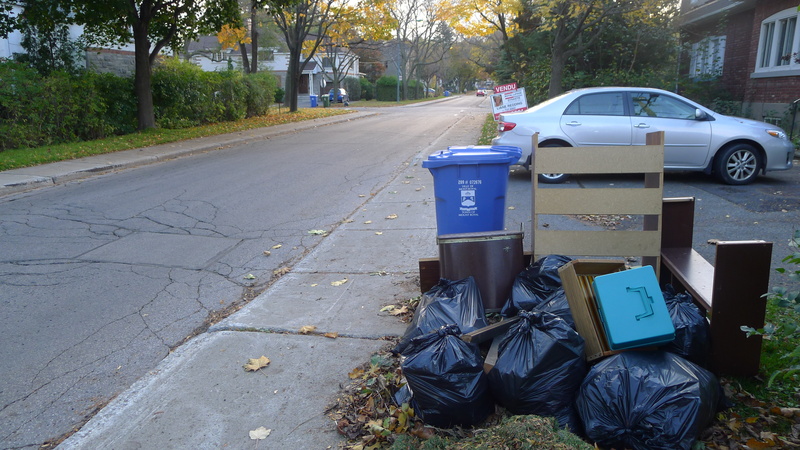 Once I was checking out the trash and recycling in middle Westmount.There were two other people doing the same thing on the street I was on.I saw three other scavengers on adjoining streets as I returned home downhill.Upper Westmount may have fewer scavengers,but a lot of people seem to scavenge in lower and middle Westmount.During my scavenging,I took out superb handbags,some 20-cent beer cans and some stationery.i have a bike with only one plastic milk crate so I could not have carried more anyways.In the three streets I scavenged,I did not see too much of value that I could not take.But other people,I think,had scavenged there before me.I urge you to scavenge in Westmount.I have never scavenged in Ville of Mont Royal.But I am surprised TMR has almost no scavengers,but TMR almost none. Someone asked me about the native art already. I still have to get back to them actually… I was thinking of keeping the badminton racquets, I love to play but I haven’t been able to in years. Maybe this winter I’ll try to find a place with courts available. Coming to this late, but wanted to let you know I’ve seen pendants like the larger green one before. I was bought one as a gift in New Zealand, Assuming yours is the same, and it looks identical, it’s a Jade pendant, the twists signifying “forever and ever”.